A little while back HTC began a new program, the HTC Advantage Program. A major component of the program was a commitment to bringing the latest and greatest software to their flagship devices for at least 2 years. So far HTC has done a great job as the M7 line, which includes the One, One Mini, and One Maxx, has been kept very up to date and it looks like things will keep on rolling. 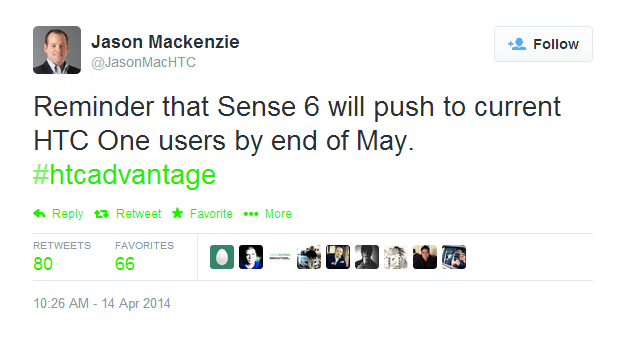 HTC has confirmed via tweet that the HTC One (M7) will get treated to Sense 6.0 and treated to it soon! The update, according to HTC’s Jason Mackenzie, will be available in May. Hopefully the update doesn’t face any major carrier testing delays. The post HTC Confirms That The HTC One M7 Will Get Sense 6.0 appeared first on Android in Canada Blog.